One of the best third basemen of all time, the Rangers' Adrian Beltre is a lock for the Hall of Fame. But before he gets there, he wants to win an elusive championship. Get breaking news and SI's biggest stories instantly. Download the new Sports Illustrated app (iOS or Android) and personalize your experience by following your favorite teams and SI writers. Nearly everything Adrian Beltre does on the baseball field is violent. From his vicious whip of a swing to the way he charges dribblers to the swipe he takes at any hand that comes within a foot of his head, there is a barely controlled ferocity to each element of his game. He doesn't make it look easy; he makes it look dangerous. Which it is for his teammates when they reach out toward his helmet—at least a weekly occurrence by the end of the 2015 season, as Texas went 38–22 over the last two months to steal the division title. When Beltre returns to the dugout after a big hit (fellow Rangers are too smart to go after him when he's upset), they set themselves up: Whoever is closest high-fives Beltre, while someone else—usually shortstop and best-friend-slash-chief-pest Elvis Andrus—knocks Beltre's helmet off from behind. The hand darts in, and the offender scurries away before the 5'11", 220-pound third baseman can retaliate. "I thought about killing him," Beltre once famously said of then Red Sox teammate Victor Martinez, one of the most notorious helmet thieves. "I thought about it ... but I have a family, so I didn't." He was kidding. But if you've ever seen the look he gives the practical joker afterward, you'd be forgiven for not being sure. Last season Beltre appeared in a commercial for the Rangers that had him playing Duck Duck Goose with a group of elementary schoolers. Even there, though, there's no shot of a head touch. It's a quirk that has spread in the Beltre household. Nine-year-old Adrian Jr. announced last year that his skull, too, is off-limits. A.J. 's Little League teammates, of course, have taken that as an invitation, and A.J. reacts in a familiar way. "Same thing as his dad!" says his mother, Sandra. "He tries to beat them up." The origin of the ritual is unclear. 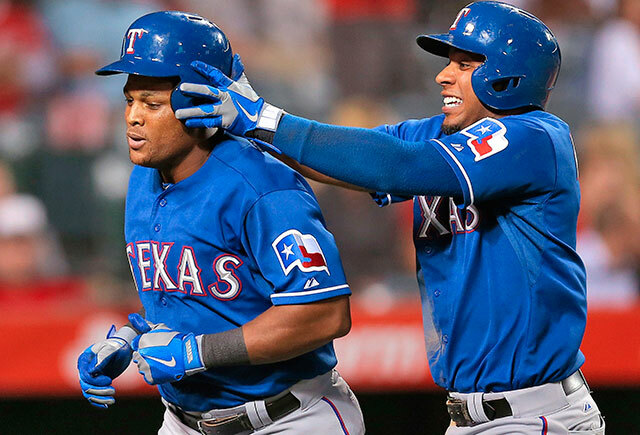 Beltre just never liked having his head touched, even as a kid. He doesn't remember which teammate he first told about it, but it accidentally guaranteed that he'd spend the rest of his career glancing over his shoulder. The whole exercise is a delight to watch, and it may be what fans know him best for. But Beltre is much more than the costar, along with Andrus, in a nightly vaudeville routine. Between his careerlong defensive brilliance and his later-in-life offensive surge, Beltre is baseball's most underappreciated future Hall of Famer. He's also the greatest active player never to have won a championship. Texas manager Jeff Banister says his team's primary goal is "to be able to help put a World Series ring on his finger." And this Rangers squad, with a strong lineup and potentially its best pitching staff since the team played in back-to-back Fall Classics in 2010 and '11, might be Beltre's best shot. ​Beltre at-bats are rarely dull, given the little dance he does in the batter's box—in which his wrists check his swing, but his feet can't quite stop—and his tendency to take gigantic cuts at anything within a mile of the plate. (Beltre once hit a home run on a ball over his head. The pitcher was waiting for him the next day to say, "What the hell?") But as much fun as it is to watch him hit, the real magic comes when he's wearing out the dirt around third base. Beltre's arm, his positioning, his reads of the ball off the bat, his ability to reach anything hit to his side of the infield: They all combine to create easily the best third baseman of his generation. Beltre's range is tremendous; he drives Andrus crazy by fielding balls hit to shortstop. "I'm in charge!" Andrus says. "But it's pretty hard when you have him at third base. He calls me off." They fool around on routine pop flies, camping out annoyingly close to each other and miming the catch and throw in sync with the real thing. Last year, after Andrus made a catch Beltre thought should have been his, they jokingly drew a line in the dirt between second and third to define their zones. Beltre makes diving stops and snags line drives through a combination of preparation and reaction time, but his bread and butter is the slow roller, which he charges, barehands and fires off-balance to first like no one else in baseball. That's the only move he refuses to practice, because he doesn't want to get caught overthinking it. The league has caught on, and over the years Beltre has noticed fewer hitters bunting on him, but he loves his signature play so much that every so often he'll play back to bait batters into laying one down. He earns every one of his dazzling defensive stats (he's fifth in history with 208.7 fielding runs saved, behind Brooks Robinson, Mark Belanger, Ozzie Smith and Andruw Jones), ruining coaches' afternoons with his endless drills. Nearly every day in spring training, after team practice, Beltre takes three buckets of ground balls and line drives. He wants to see every possible hop, he says, and he means every. "You hoped you weren't the one who was stuck hitting 'em to him, because he doesn't stop," says Ron Washington, his manager in Texas from 2011 through '14. Washington eventually started wearing batting gloves after his hands bled during one session. Beltre was out there "until he got tired, or until you got tired, and mostly it was you who got tired. Nothing ever gets by him." Even last year, at age 36 and in his 20th season of pro ball, Beltre showed few signs of slowing down. He missed three weeks with a sprained left thumb, which bothered him all season—by August he was catching the ball in pregame warmups to the outside of his glove so he didn't have to squeeze with it—but rebounded to finish as the ninth most valuable player in the American League by WAR. He saved more runs defensively (18 more than the average player) than any other AL third baseman. Before last season his now five-year-old daughter accidentally erased the extensive notes on pitchers that he keeps on his phone, but even hitting essentially blind he increased his line drive rate for the fourth straight year, to 23%, and was the third-hardest man in the league to strike out. He hit for his third career cycle last August—in the first five innings of a game. 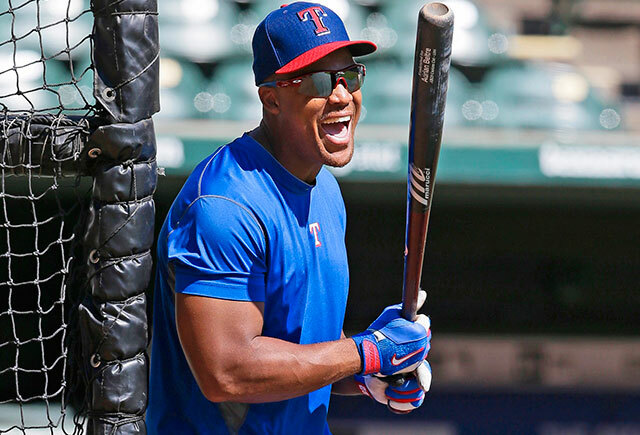 Beltre, who turns 37 in April, attributes his graceful aging to experience. "You have an idea of how they are trying to get you out, like with a high fastball," he says. "I wait for that, because all I have to do is touch it. Boom—the ball just goes." This strategy also helps him keep his eye level up; that way he won't chase a ball in the dirt (his biggest temptation as a young player), because it looks like it's miles away. After he returned from the DL in June, he hit .320 and slugged .500 on high fastballs. Beltre has been a star in the field since the Dodgers signed him illegally from the Dominican Republic at age 15, a year before he was eligible. But on offense, his favorite part of the game, he has had more of a roller-coaster ride. Los Angeles promoted him at 19 years and two months, an age no one has since beaten. Beltre was Bryce Harper before Bryce Harper—it took him two years to face a pitcher younger than himself. Though he had flashes of success at the plate, he was inconsistent until his final year in L.A., when he put up a 1.017 OPS with a major league-leading 48 home runs and finished second in MVP voting to Barry Bonds. The Mariners rewarded him with a five-year, $64 million deal and 81 games a year in one of the worst parks in baseball for home run hitters, 405 feet to straightaway center. Trying to earn his contract, trying to be "the guy" in Seattle, he pressed to four league-average offensive seasons, although he won two Gold Gloves. "Sometimes people forget how difficult hitting is," Beltre says, "because you have to do everything perfect. You have to be looking for that pitch, put your foot down early, see the ball, make good contact and run it out." He signed a one-year "pillow contract" with the Red Sox before the 2010 season, figuring that between the Green Monster and a stacked Boston lineup, he had a good chance to rebound and reestablish his value for a long-term deal. And it was with the Red Sox, at age 31, in his 12th full major league season, that Beltre became an All-Star for the first time. He had an OPS of .919 and led baseball in doubles, with 49. So when Texas was looking to shore up the left side of its infield to protect a pitching staff that leaned on sinkerballing lefties C.J. Wilson and Matt Harrison, Beltre was at the top of the list. In early January 2011, Texas offered the third baseman five years and $80 million guaranteed, plus a $16 million option for '16 (which the club picked up in February '15). Even Bud Selig underrated Beltre, perhaps buying into the popular myth that he performed well only during contract years; that winter Selig called Beltre's signing the worst deal of the '10–11 off-season, a period that included the seven-year, $142 million Carl Crawford contract. "He's as important a signing as we've made," Daniels says of the player he jokingly calls the team's "angry grandpa." Indeed, after only five years Beltre's 31.5 WAR in Texas is 10th highest in franchise history. The 2015 season was the third in which he was the Rangers' best player, and in the other two he was a close second. Since Beltre arrived, Texas has won at least 88 games every year except '14, when various players spent 2,116 days on the disabled list, the most since The Hardball Times began recording the statistic in '02. The Rangers were one strike away from winning the World Series in '11, Beltre's first year. He's been worth 83.8 WAR over his career, 56th best among all players ever and sixth among third basemen. (With an average Beltre season in '16 he'll pass Chipper Jones and George Brett, leaving only Mike Schmidt, Eddie Mathews and Wade Boggs ahead of him.) Every eligible player ahead of Beltre other than Bonds and Roger Clemens is in the Hall of Fame. And plenty of that production has come while Beltre was hurt. "He has an unbelievable ability to control his body," says Dave Magadan, Beltre's hitting coach in Boston and then again in Texas. "I've seen guys try to play hurt, and they were at 50% of what they could do. When he plays hurt, he gives you his normal production." Beltre was famous in the Dodgers' organization for his reaction to a ruptured and infected appendix that almost killed him when he was 21. He went two months without solid food, subsisting on clear soup and orange juice in the spring training clubhouse. Bored and cranky, IV port still in his arm, he demanded to be allowed to play, and eventually the trainers decided to let him. "He tucked his colostomy bag under his uniform," remembers Don Welke, then a Dodgers scout, and took ground balls on the back fields. "Soreness is not going to get me off the field," Beltre says. This is an understatement. He has refused to take significant time off for injuries ranging from last season's thumb sprain—in which the tendon was wrenched from the bone so violently that it tore the skin—to perhaps his most famous setback, a ruptured right testicle that swelled to the size of a grapefruit. Beltre paid the price for his lifelong refusal to wear a cup when he took a hard grounder to the crotch during the ninth inning of a 2009 game against the White Sox. He finished the game, singling and scoring the winning run in the 14th inning. In his first at-bat back from the disabled list two weeks later, the Seattle public address system played "The Nutcracker Suite" as his walk-up music. Beltre still doesn't wear a cup. "If the ball's going to hit me there every 11 1/2 years, I'll take my chances," he said at the time. His teammates and coaches joke that he plays better injured, that pain reins him in, and he doesn't entirely disagree. "I'm not thinking about my swing," Beltre says of hitting injured, as he did in the 2015 ALCS, when he strained his back so badly that he needed a cortisone shot between innings. He decided he had one cut left in him that day; it was an RBI single. "I'm thinking, I have to square this ball up," he says, "because I don't want to miss it and then have to swing again." Nothing Beltre does is textbook. Where other defenders study hitters' tendencies, he largely ignores whoever is at the plate, focusing only on who's pitching when he positions himself. Little League coaches teach their infielders to catch and throw the ball on the run, as part of one fluid motion; Beltre's arm is so strong that the only way he can control his throw is if he comes to a stop, plants his feet and uncorks. Young sluggers learn to use both legs to generate power; Beltre shifts his weight almost entirely to his front leg on big cuts at low breaking balls, often going down on one knee as the ball leaves the park. "I know it's unorthodox," says Washington, "but what the plain eye doesn't see is how good his feet and hands are. It looks like poetry in motion." Despite all that, it's what Beltre brings to the clubhouse that his teammates can't stop talking about: the suits he buys for rookies; his ability to say what needs to be said (in whatever language it needs to be said) without embarrassing anyone; the example that his sky-high pain threshold sets for teammates. Beltre buys birthday cakes for everyone from Banister to first baseman Prince Fielder to media relations director John Blake. He invites clubhouse guys to concerts. He pranks opponents as well as teammates, such as when he sent Angels righthander Garrett Richards an invoice for $300 after the pitcher broke three of his bats in a game last April. Beltre's face seems to have three settings: grinning, glaring and thinking. He watches each pitch intently, leaning forward, yelling gibberish, ordering around his teammates, then valiantly argues every charge levied against him in the clubhouse's kangaroo court (usually for talking on the phone in the clubhouse), diagnosing everyone in the vicinity with amnesia. "He always wins," says his old Mariners buddy Felix Hernandez. "When he doesn't win, he ties." Teammates call Beltre Captain, or Legenda, both of which he despises. (Fielder encourages a visitor to "Go over there and ask him when he's gonna get the C on his jersey. Let me know what he says." Answer: "I hate those guys.") Beltre wouldn't let teammates celebrate his 400th home run, last May, because the Rangers lost. "You might not believe me," he says, "but I don't really care about the numbers. The only thing I am missing is to be a champion, and then I can retire anytime I want." Can't you just picture it? Somewhere down the line, in 2024 or 2027, the Hall of Fame dedicates Adrian Beltre's plaque. It has him in a Rangers cap, of course. And from somewhere to the side of his bronze likeness reaches the hand—sneaky, deft, practiced—of Elvis Andrus, moving toward his head.